Rick Escobar & his chums work very hard for several years cultivating what is both an original and very vintage sound used as a vehicle for Rick's wonderful writing. Days in the studio on multi-tracks, and mixes & remixes has paid off with a totally killer CD in waiting. CD in waiting because I'm reviewing a CD-R written from the session DAT. Some label really ought to pick this up! If you're a label, don't pass this up! If your a fan, get set for the best CD in a vintage style in years. There are no dogs in this set. 11 originals and a handful of covers or live material yet to be determined. CD not yet released, so ya gotta wait! Sorry! With a sitar peaking out of the mix, Rick Escobar Y pals chunk out a grand surf epic that just oozes caravans of spice traders on the road to Morocco. This speedy powerful and melodic shredder will make even the sleepiest camel bow to Mecca and pray for surf! The best trad surf band the Bay Area has ever seen, and among the best world wide, The Woodies embodied everything that traditional surf was, but did it with Rick Escobar's amazing writing. They almost got signed to AVI last year. Alas, they broke up recently. This track was recorded in '95 at an event Robert Emmett and I co-hosted called Psychotronic Surf. The crowd's reaction at the end tells all. They were great! RIP! A marvelously written modern surf classic, precisely written as if it were 1963, but it's not. Melodic, chunky, and oozing stormy swells just off the lighthouse at Steamer Lane. Cool. The happiest surf song ever written - bar none! Titled for surf fan Bernie Beckwith, this incredibly infectious song features an absolutely brilliant melody line and a childlike rhythm track that screams out happy fun. Totally amazing. From the fertile mind of Rick Escobar comes one of those mergers that leaves you saying of course. Take the nineties best trad surf bad, make 'em do the Greek line dance and yell "Hey!" a lot, and through in some Greek folk changes, and you have what should have been done eons ago. Totally wonderful! This dark and powerful track celebrates the fast and dangerous ride on a wave racing towards the rocks. You can just see a rider on a short board shredding back and forth across the face, all the while watching the approaching rocks, trying to get every last zig out of the wave before cutting back at the last possible minute. Great track. Occasionally known as "Fajita Sunrise," this spunky and pretty track oozes Mexican scenes, señoritas on the shore, waves off Baja, and a spicy taqueria. For the album, Rick brought in a Mariachi trumpet player to enhance the already splendid song. From the opening horror laugh, this ominous track reeks of monsters riding the waves after dark, haunting the surf, and stalking the unsuspecting. Closing out side one is a great sounding track from my favorite Woodies, a song they've played for a few years now called "Little Dume" It's a wonderful tune, and this version is quite inviting, capturing your attention wholly while you play the disc. This very pretty song goes without a name still, as Rick never found one, just like "Spanish Word." It has a strong sense of island mystery at a balmy afternoon lagoon. It also has a bit of the Southwest to it. Very melodic and pretty. This bonus track (not intended for the album) is a fine pure trad cover of the Eddie and the Showmen classic. It features all the right intensity buildups, and the sound is pure Woodies. Another bonus track, this is a strait cover of the Lively Ones classic, but different in character from the original. 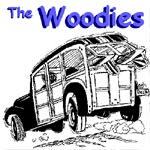 It's been Woodie-ized, with their usual chunk in lieu of high energy intensity. Not that it is low energy, it's just quite different sounding than the original, since this band's sound is so different from theirs. As covers of this over covered classic go, this bonus track is really solid. The Woodies' sound is similar to the Pyramids' version, but more chunky and louder, so this has more oomph! Punchy, gutty, cool! This is the best studio cover of this track ever! I only qualify "studio" track, because I have a live recording of the Woodies doing this that is even hotter! It's major chunky, cowboy surf with super humor in the playing. Totally rhythmic and rolling, incredibly infectious!